A new stay at home mom, with 2 kiddos 2 and under, learns the way to domestic bliss through frugality, creativity, and love for being home with her babies. I don't have an almost 2-year-old. I have a complete Daredevil. 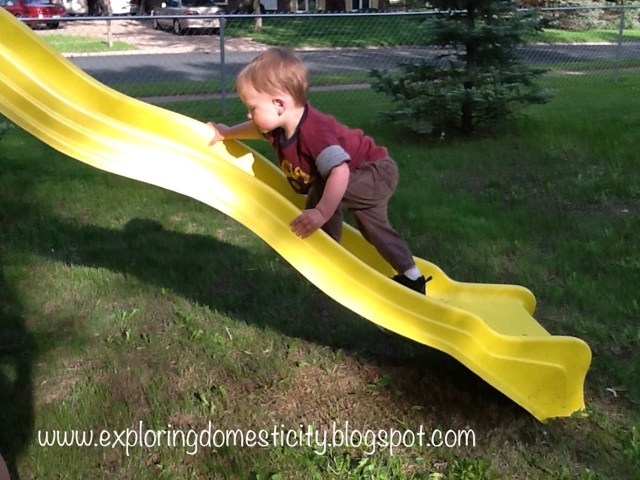 My little guy lives for climbing up on the huge swing set and racing down the slide. This scares a Momma to death. Especially since the ladder that was on the swing set was spaced so far apart that his knee practically hit his chin as he climbed to the top. I about had a heart attack each time I saw him head toward that death trap! I decided we needed a bit safer way for him to make it to the top, since we can't keep the kiddo away from it. And, yes, we still stay at his side - he is TWO after all! This is the swing set. I wish I had a photo of this thing when we got it! It's about 20 years old and was looking every bit it's age! My husband spent an insane amount of time on this thing; reinforcing the whole structure and painting and cleaning. There is no stopping this kid! 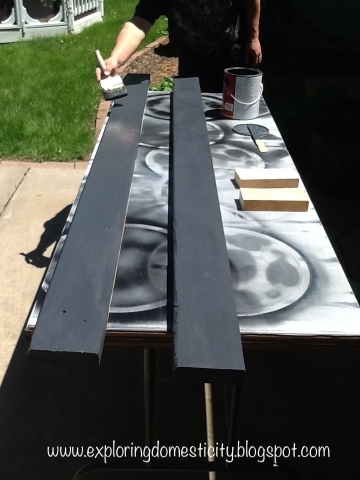 My husband got to work painting the two 2x6 boards to support the tires. He didn't feel like borrowing a saw and taking the time to cut angles, so he attached some blocks of wood to the swing set. He then placed the boards above them and secured them to the blocks. 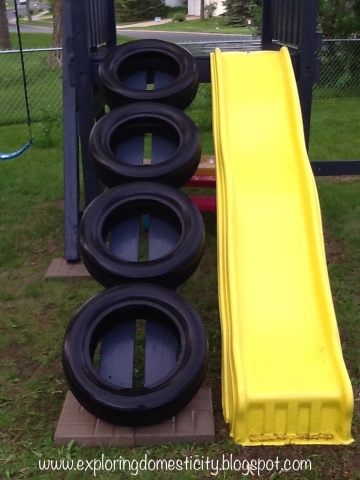 The end is unfinished because we ended up removing 6 inches from the 10 foot board to get the tires to line up better with the angle of the slide. 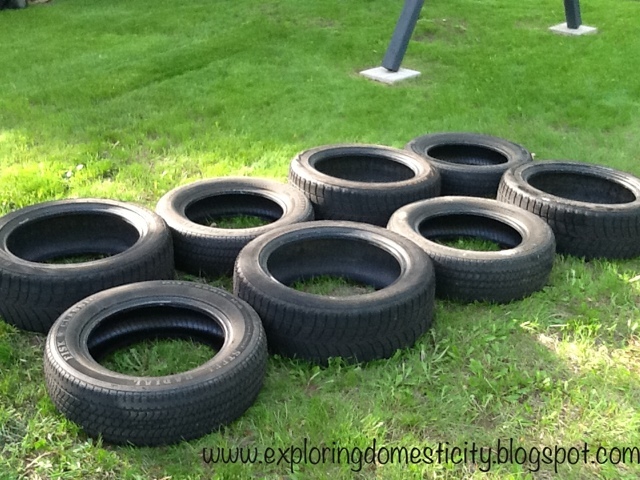 For some reason, both of us totally overestimated the room we would have for this project and thought we would be able to do two rows of tires. 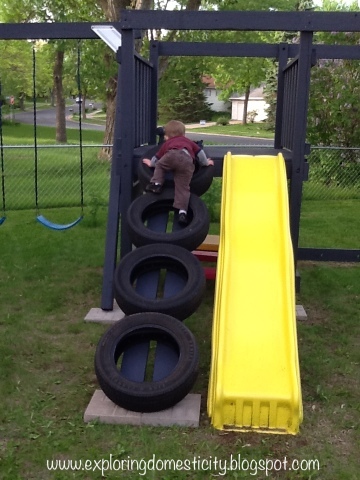 It worked out ok because we couldn't find matching sets and found that the smaller tires looked much better and more stable for climbing. We also originally thought we would need a bunch of bolts to hold all the tires together but, with being able to support one row of tires on two boards, all we needed were some long screws. We secured each one with eight screws. **Edit** I forgot to mention that we drilled about 4 holes along the bottom of the tire to allow them to drain when it rains. Very important step for people in mosquito-infected areas! I was hoping to paint them a fun, bright color but time was an issue - we needed something ASAP to keep that kiddo from climbing the ladder! I may do it someday but the tires need to be cleaned really well, I need to prime them, and it likely won't hold up the greatest. I'm still thinking about adding some safety features but it is a big improvement! My husband also added three more steps to the ladder - finally! Like I said, we stay close because this kid is only two - even if he doesn't know it! This thing is looking better and better. Next up: an awning for the top and a cover for the baby swing. You might catch me at these fine parties. This is a fantastic idea! 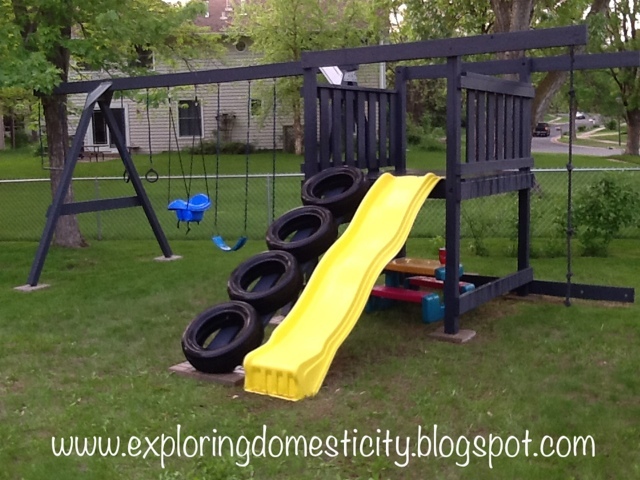 I'm pinning this for sure, you make me want to make a play structure for my kids! Thank you! We have a bit left to do, but can it ever be safe enough? Those kiddos always find ways to scare us! This is the coolest idea! I love how it turned out...pinning! I love this idea. We have a renovated swing set also, and my sons ( I think it is all boys) have no fear! Ah, boys! I think my body stays tense the entire time I watch him play! This is a fabulous idea!! Pinning, and hopefully using! I hope you do - it is a pretty simple project and looks so fun! How very cute, Kristin!! Thanks for linking up at the Pinterest Power Party this week! Enjoy your weekend! Hey, this is an amazing idea! 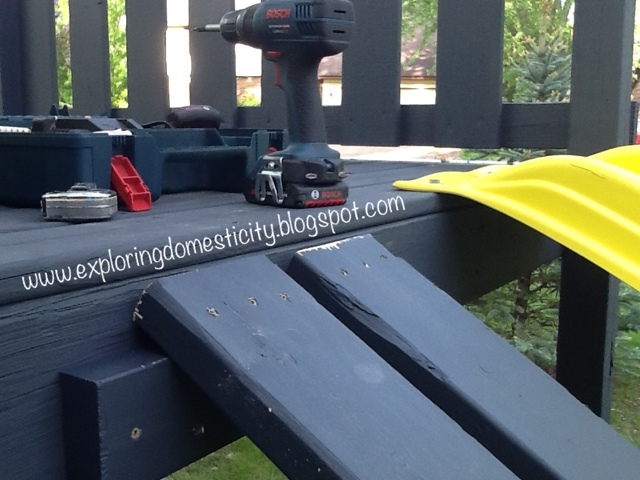 We are always looking for ways to spruce up our playset. We're going to try to add a rope ladder or a swingy ladder to ours since our kids are a little older. We also bought a steering wheel but haven't attached it yet. You can't go wrong with a steering wheel! One thing: You should drill some holes in the bottom of the tires, so water can drain when it rains (unless you live somewhere with very little rain - in that case, ignore me, lol). I don't know exactly where to drill. Maybe pour some water and drill until there's no standing water? 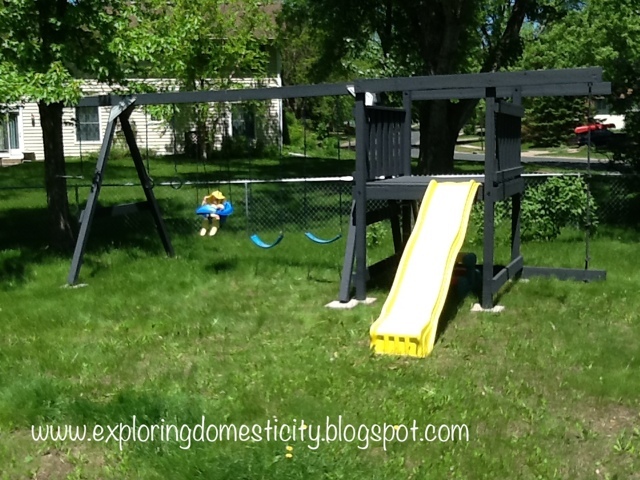 You don't want his playset to become a breeding ground for mosquitoes! 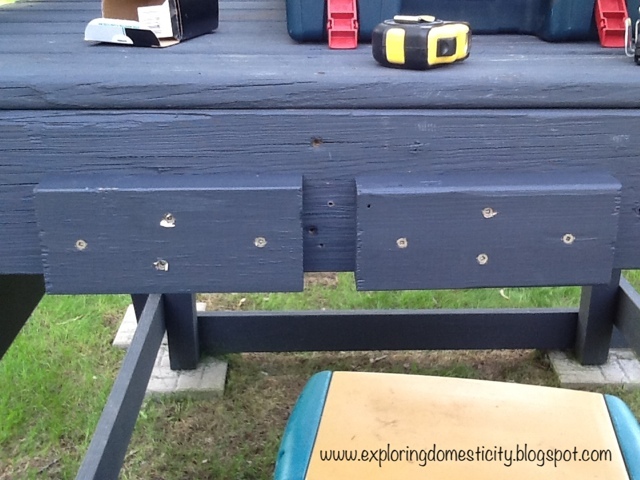 I think there was another reason to drill holes, but that's the main one I remembered (I hate being bit, lol). 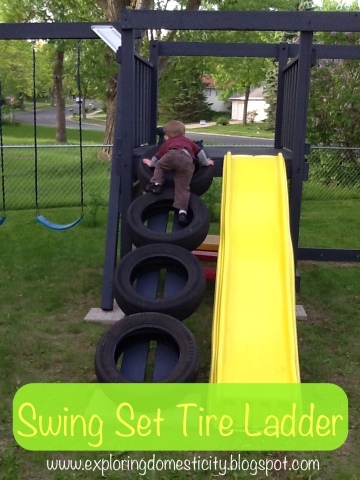 Thanks for the tire ladder idea!! You are completely right! 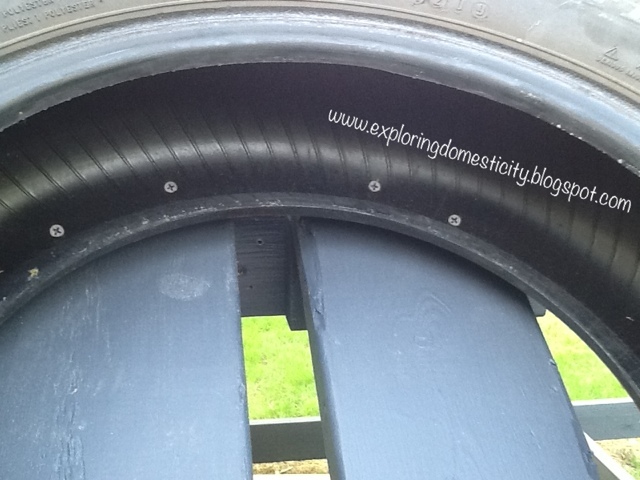 I forgot to mention that we drilled holes in the bottom of each tire. Very good point about mosquitoes! We are in MN and I swear they are our national bird. :) I'll update with that added information - thanks for bringing it to my attention! LOVE this!! You are AMAZING!!! Aww... I'm blushing :) Thanks for such a nice comment! This is such a great and easy idea. I found a pic on pinterest and I'm so glad I did. Definitely going to give this a try! Thanks!! I LOVE comments and, don't worry, there are no words to squint at and verify on this blog!! :) So, have at it!